Objectives: To investigate the predictive value of urinary neutrophil gelatinase-associated lipocalin in the occurrence of delayed graft function after kidney transplant. Materials and Methods: In this prospective cohort study of 67 consecutive patients who received a living-related (40 patients [61%]) or deceased-donor kidney transplant (27 patients [39%]), urinary neutrophil gelatinase-associated lipocalin was determined in the first 100 mL perfusate of the donor kidney and in urine at 6 hours after transplant. Patients were followed (11 ± 7 mo) for changes in estimated glomerular filtration rate and delayed graft function. 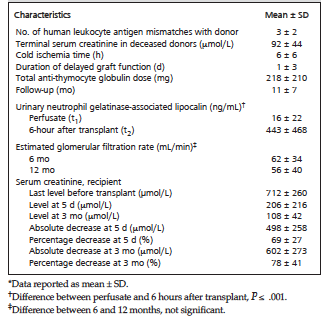 Results: The mean urinary neutrophil gelatinase-associated lipocalin level at 6 hours after transplant was significantly higher after deceased-donor (781 ± 452 ng/mL) than living-donor transplant (229 ± 223 ng/mL; P ≤ 0.001). The decrease in estimated glomerular filtration rate from 6 to 12 months after transplant was positively correlated with the urinary neutrophil gelatinase-associated lipocalin levels in the perfusate in living-donor transplant. A significant correlation was noted between the occurrence of delayed graft function and the urinary neutrophil gelatinase-associated lipocalin level at 6 hours after living-donor transplant. In the deceased-donor group, the occurrence of delayed graft function was correlated with urinary neutrophil gelatinase-associated lipocalin levels in the perfusate. In deceased-donor kidney transplant, the mean urinary neutrophil gelatinase-associated lipocalin level in the perfusion fluid was significantly greater from donors who had terminal serum creatinine > 150 μmol/L, and urinary neutrophil gelatinase-associated lipocalin level at 6 hours after transplant was significantly greater in transplants with longer cold ischemia time and donors who had hypertension. 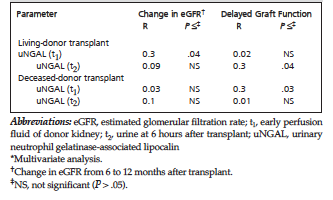 Conclusions: Urinary neutrophil gelatinase-associated lipocalin levels in the donor kidney perfusate and 6 hours after transplant may be a useful predictor of delayed graft function and decreased graft function from 6 to 12 months after transplant. Deceased-donor kidney transplant frequently is associated with delayed graft function (25%).13 The rate of improvement in kidney function during the days after transplant is multifactorial and may depend on whether the donated kidney is optimal or marginal.14 However, there is no test available to predict which allograft will have slow recovery of kidney function or delayed graft function. The purpose of the present study was to evaluate uNGAL in the donor kidney perfusion fluid before transplant and in urine samples at 6 hours after transplant to determine whether uNGAL may be predictive of acute kidney injury such as delayed graft function and renal outcome at 6 and 12 months after transplant. In this prospective cohort study, all 67 consecutive patients who received a living-related or deceased-donor kidney transplant at King Abdulaziz Medical City, Riyadh, between July 2011 and September 2012 were evaluated. Written informed consent was obtained from all participants. The study was approved by the local institutional review board. Data collected were entered into database software (Access, Microsoft, Redmond, WA, USA) and analyzed with statistical software (SAS, version 9.2, SAS Institute, Cary, NC, USA). Descriptive statistics were reported as mean ± standard deviation (continuous variables) or number (%) (categorical variables). Continuous variables were evaluated with t test. Multivariate analysis was used to evaluate the effect of potentially confounding variables on the predictive effect of uNGAL. Statistical significance was defined by P ≤ .05. Most recipients were male patients who had living-related kidney transplant and who did not have diabetic nephropathy or positive panel reactive antibody (Table 1). The deceased donors most frequently died because of stroke and most frequently did not have hypertension or diabetes (Table 1). Most recipients received basiliximab and anti-thymocyte globulin as induction immunosuppressive therapy, and most recipients did not have delayed graft function or biopsy-proven rejection (Table 1). The mean cold ischemia time was 6 ± 6 hours, and the mean uNGAL level was significantly greater at 6 hours after transplant than the uNGAL level in the perfusate (Table 2). Mean follow-up was 11 ± 7 months after transplant, and eGFR was similar at 6 and 12 months after transplant (Table 2). Multivariate analysis showed significant correlations between the change in eGFR from 6 to 12 months and uNGAL in the perfusion fluid for living-donor transplant (Table 3). In addition, there were significant correlations between delayed graft function and uNGAL at 6 hours after living-donor transplant and between delayed graft function and uNGAL in the perfusion fluid for deceased-donor transplant (Table 3). The mean uNGAL level in the perfusion fluid and at 6 hours after transplant was significantly higher in patients who developed than did not develop delayed graft function (Table 4). The mean uNGAL levels at 6 hours after transplant (but not in the perfusion fluid) was significantly greater for deceased-donor than living-related kidney transplant (Table 5). 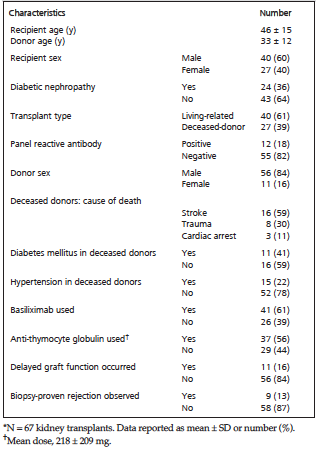 In deceased-donor kidney transplant, the mean uNGAL levels at both collection times were similar in transplants with positive or negative panel reactive antibody status but greater in transplants from donors who had than did not have diabetes mellitus (Table 6). 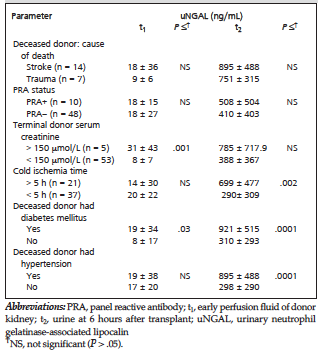 In deceased-donor kidney transplant, the mean uNGAL level in the perfusion fluid was significantly greater from donors who had terminal serum creatinine > 150 μmol/L, and uNGAL level at 6 hours after transplant was significantly greater in transplants with longer cold ischemia time and donors who had hypertension (Table 6). There was no correlation observed between the uNGAL levels in the perfusion fluid and the absolute or percent decrease in serum creatinine from baseline (before transplant) to 5 days or 3 months after transplant. However there was significant negative correlation between the absolute and percent decrease in serum creatinine at 3 months after transplant and the uNGAL levels at 6 hours after transplant (t2 sample) (Table 7). In both living-donor and deceased-donor transplants, we observed a significant correlation between delayed graft function and uNGAL levels. The uNGAL level of the perfusate was significantly higher in patients who developed than did not develop delayed graft function (Table 4). The uNGAL level at 6 hours after transplant was 3.4-fold greater after deceased-donor than living-donor transplant (Table 5). We observed no correlation between uNGAL levels in the t1 sample and the absolute or percent decrease in serum creatinine from baseline to 5 days or 3 months after transplant. However, there was a significant negative correlation between the absolute or percent decrease in serum creatinine and uNGAL at 6 hours after transplant (t2 sample) (Table 7). Levels of uNGAL in the perfusion fluid (t1) were predictive of reduction in eGFR at 12 months after living-donor but not deceased-donor transplant (Table 3). Higher uNGAL levels were observed with longer cold ischemia time (> 5 h; t2 levels), higher deceased-donor terminal serum creatinine (> 150 μmol/L; t1 levels), and diabetic (t1 and t2 levels) or hypertensive donors (t2 levels) (Table 6). In summary, we confirmed that uNGAL concentrations measured during the first day after kidney transplant may be useful in predicting the development of delayed graft function. In addition, uNGAL measured in the donor kidney perfusate also may help predict the development of delayed graft function and decreased short-term graft function. Star RA. Treatment of acute renal failure. Kidney Int. 1998;54(6):1817-1831. Tomlanovich S, Golbetz H, Perlroth M, Stinson E, Myers BD. Limitations of creatinine in quantifying the severity of cyclosporine-induced chronic nephropathy. Am J Kidney Dis. 1986;8(5):332-337. Baboolal K, Jones GA, Janezic A, Griffiths DR, Jurewicz WA. Molecular and structural consequences of early renal allograft injury. Kidney Int. 2002;61(2):686-696. Chertow GM, Burdick E, Honour M, Bonventre JV, Bates DW. Acute kidney injury, mortality, length of stay, and costs in hospitalized patients. J Am Soc Nephrol. 2005;16(11):3365-3370. Wu I, Parikh CR. Screening for kidney diseases: older measures versus novel biomarkers. Clin J Am Soc Nephrol. 2008;3(6):1895-1901. Ronco C. N-GAL: diagnosing acute kidney injury as soon as possible. Crit Care. 2007;11(6):173. Bachorzewska-Gajewska H, Malyszko J, Sitniewska E, et al. Could neutrophil-gelatinase-associated lipocalin and cystatin C predict the development of contrast-induced nephropathy after percutaneous coronary interventions in patients with stable angina and normal serum creatinine values? Kidney Blood Press Res. 2007;30(6):408-415. Dent CL, Ma Q, Dastrala S, et al. Plasma neutrophil gelatinase-associated lipocalin predicts acute kidney injury, morbidity and mortality after pediatric cardiac surgery: a prospective uncontrolled cohort study. Crit Care. 2007;11(6):R127. Nickolas TL, O'Rourke MJ, Yang J, et al. Sensitivity and specificity of a single emergency department measurement of urinary neutrophil gelatinase-associated lipocalin for diagnosing acute kidney injury. Ann Intern Med. 2008;148(11):810-819. Zappitelli M, Washburn KK, Arikan AA, et al. Urine neutrophil gelatinase-associated lipocalin is an early marker of acute kidney injury in critically ill children: a prospective cohort study. Crit Care. 2007;11(4):R84. Ostermann M, Chang RW. Acute kidney injury in the intensive care unit according to RIFLE. Crit Care Med. 2007; 35(8):1837-1843. Lacquaniti A, Buemi F, Lupica R, et al. Can neutrophil gelatinase-associated lipocalin help depict early contrast material-induced nephropathy? Radiology. 2013;267(1):86-93. Szwarc I, Garrigue V, Delmas S, Deleuze S, Chong G, Mourad G. Delayed graft function: a frequent but still unsolved problem in renal transplantation [in French]. Nephrol Ther. 2005;1(6):325-334. Schnuelle P, Gottmann W, Köppel H, et al. Comparison of early renal function parameters for the prediction of 5-year graft survival after kidney transplantation. Nephrol Dial Transplant. 2007;22(1):235-245. Mishra J, Ma Q, Kelly C, et al. Kidney NGAL is a novel early marker of acute injury following transplantation. Pediatr Nephrol. 2006;21(6):856-863. Schaub S, Mayr M, Hönger G, et al. Detection of subclinical tubular injury after renal transplantation: comparison of urine protein analysis with allograft histopathology. Transplantation. 2007;84(1):104-112. Grenier FC, Ali S, Syed H, et al. Evaluation of the ARCHITECT urine NGAL assay: assay performance, specimen handling requirements and biological variability. Clin Biochem. 2010;43(6):615-620. Halloran PF, Hunsicker LG. Delayed graft function: state of the art, November 10-11, 2000. Summit meeting, Scottsdale, Arizona, USA. Am J Transplant. 2001;1(2):115-120. Parikh CR, Jani A, Mishra J, et al. Urine NGAL and IL-18 are predictive biomarkers for delayed graft function following kidney transplantation. Am J Transpl. 2006;6(7):1639-1645. Rostami Z, Nikpoor M, Einollahi B. Urinary neutrophil gelatinase associated lipocalin (NGAL) for early diagnosis of acute kidney injury in renal transplant recipients. Nephrourol Mon. 2013;5(2):745-752. Rostami Z, Einollahi B, Ghadiani MH. Does living donor hyperoxia have an impact on kidney graft function after transplantation? Nephrourol Mon. 2013;5(3): 835-839. Bachorzewska-Gajewska H, Malyszko J, Sitniewska E, Malyszko JS, Dobrzycki S. Neutrophil gelatinase-associated lipocalin (NGAL) correlations with cystatin C, serum creatinine and eGFR in patients with normal serum creatinine undergoing coronary angiography. Nephrol Dial Transplant. 2007;22(1):295-296. Hall IE, Yarlagadda SG, Coca SG, et al. IL-18 and urinary NGAL predict dialysis and graft recovery after kidney transplantation. J Am Soc Nephrol. 2010;21(1):189-197. Acknowledgements: This study was supported by a grant from the King Abdullah International Medical Research Center. The authors have no conflicts of interest to declare.